It’s been awhile since I had any posts about the seedline. As you know, there are two camps within the Christian Identity circles: one believes that there is one seedline and the other, that there are two. This article is about the two-seedline. As you read, take notes and read the Bible verses for yourself and ask yourself if this makes sense or not. To summarize last week’s program, if one is going to distinguish between Adam, eth-ha-Adam, and ha-Adam in the creation account of Genesis, assuming that these grammatical terms represent different creations of Adam, then those distinctions must hold up throughout all Scripture. However with all certainty, they do not hold up at all. They do not even hold up so far as Genesis chapter 5! In truth, they are only grammatical differences, and all references to Adam represent the same Adamic man, as Paul of Tarsus said, “the first man Adam was made a living soul”, telling us that the one and only Adam of Genesis was the FIRST MAN. While it is fully apparent that there were other hominids on earth before Adam, our mistake from the beginning was in considering them to be man. There are many Identity Christians who have been deceived by the ridiculous lie, often called the “gap theory”, which even Wesley Swift and Bertrand Comparet helped to preponderate, that somehow here the earth is described as having become void and formless, that there was a prior civilization on this earth and it was destroyed before the creation account of Genesis chapter 1. The “gap theory” was first made popular through the Scofield Bible reference notes. Yet if this were so, how is it necessary that heaven, defined in the fourth day of Genesis as the sun, the moon, and the stars, also had to be created here, or if one prefers, on the “fourth day” later in this chapter? Why did Light and Darkness not exist before the “gap” in the so-called “gap theory”? As we shall discuss in greater depth when we discuss Genesis chapter 3, there were indeed hominids on earth long before the Adamic man was created, and their creation is not accounted for in Genesis. But their presence before Adam is certainly accounted for in Scripture, and we do not need to twist the Genesis creation account in order to understand it. Only suckers fall for such fascinating tales, who are never happy with the revelation that we have by the Word of God, and therefore are willing to swallow any elaboration by men. The grammar of Genesis 1:2 makes the “gap theory” impossible. The opening word of the verse is merely a vav, a “hook”, which by itself is a particle conjunction and its translation depends upon the context. However it “hooks” the clause to the one which precedes it, which in this case is Genesis 1:1! God created the heaven and earth, AND the earth was without form and void. The vav can mean, and, so, but, then, therefore, or any one of several other possibilities, but it cannot merely be ignored that it connects the two clauses. Neither can it be asserted that it means “and then”, which is what the “gap theory” proponents demand. There are different uses of the VAV, the first appearing in Genesis 1:2 and the second appearing in Genesis 1:2. In 1:2 the VAV stands alone, prefixing the noun for earth, and that is called a “VAV Conjunctive” by Hebrew grammarians. In 1:3 the VAV is followed by another letter, the YODH, prefixing the verb for said, and that is called a VAV Consecutive by Hebrew grammarians. The “gap theory” proponents, like the “two creations” proponents, ignore simple Hebrew grammar again and again in order to promote their own Genesis account. Four assertions related to these first three opening chapters of Genesis have no second witness to support them, if they have a witness at all, and for each of those which do, their first witnesses are easily challenged: 1) the “gap theory”, 2) the idea that there were multiple creations of men called by the same name adam, 3) the idea that Adamic man was given explicit dominion over other so-called races of people, or “beasts of the field”, and 4) the idea that Cain was actually the son of Adam, which we shall get to when we discuss Genesis chapters 3 and 4. All four of these ideas are bad ideas, and not supported by Scripture. Genesis 1:6 And God said, Let there be a firmament in the midst of the waters, and let it divide the waters from the waters. 7 And God made the firmament, and divided the waters which were under the firmament from the waters which were above the firmament: and it was so. 8 And God called the firmament Heaven. And the evening and the morning were the second day. We may want to one day discuss the idea that perhaps the planet had a much richer atmosphere before the Flood of Noah, and that such is indicated here. I do not necessarily interpret this passage in that manner, however the words of Genesis 2:5-6 are intriguing in that regard. Some believe that this would account for the much longer lifespans of the patriarchs, which diminished along with some of the atmosphere after the flood. I would not dispute such an idea, since it seems to be supported by Scripture, however it is peripheral to two-seedline studies and any investigations of Genesis for historical and theological purposes, so we may just want to place it on the back burner. Genesis 1:9 And God said, Let the waters under the heaven be gathered together unto one place, and let the dry land appear: and it was so. 10 And God called the dry land Earth; and the gathering together of the waters called he Seas: and God saw that it was good. 11 And God said, Let the earth bring forth grass, the herb yielding seed, and the fruit tree yielding fruit after his kind, whose seed is in itself, upon the earth: and it was so. 12 And the earth brought forth grass, and herb yielding seed after his kind, and the tree yielding fruit, whose seed was in itself, after his kind: and God saw that it was good. 13 And the evening and the morning were the third day. As Clifton Emahiser has pointed out in his series of essays entitled Lies Masquerading as the Truth, Genesis chapter 1 is not written as a detailed scientific account of creation in perfect step-by-step chronological order. If it were, then here we have grass and other plants growing before there existed a sun and a moon. Since plant life cannot exist without the sun, as there would be no way for the chemical process of photosynthesis to operate upon which all plant life depends, then this creation account must be understood as something other than an exact chronological narrative. Rather, we should esteem the Genesis 1 creation account to be a series of six episodes, and each episode describes different facets of the creation in a poetic and non-chronological fashion, with the pinnacle of that creation being the creation of Adamic man. Each of these episodes may or may not supply greater detail of the creation already explained in preceding episodes. The Creation is described in six parts, which are days or ages, so that Man has a model for his own Sabbath work cycle, which is revealed later in Scripture. Genesis 1:14 And God said, Let there be lights in the firmament of the heaven to divide the day from the night; and let them be for signs, and for seasons, and for days, and years: 15 And let them be for lights in the firmament of the heaven to give light upon the earth: and it was so. 16 And God made two great lights; the greater light to rule the day, and the lesser light to rule the night: he made the stars also. 17 And God set them in the firmament of the heaven to give light upon the earth, 18 And to rule over the day and over the night, and to divide the light from the darkness: and God saw that it was good. 19 And the evening and the morning were the fourth day. This alone indicates that each “day” of creation should not be interpreted as a literal 24-hour period, since those periods are not even fully explained before the account of the fourth “day”. Rather, the “day” of Genesis can better be interpreted as an epoch, or age. However what we see here on this fourth day is not the actual creation of the sun and moon. Rather, what we see here is a further explanation of the creation of the Light, the Day, and the Night which were actually created on the first day. So the Genesis account of creation does indeed repeat itself. As for the duration of a day, Yahweh God exists outside of time, and He is the author of time. Therefore we should not imagine that He can be bound by time. As the apostle Peter says, “one day is with the Lord as a thousand years, and a thousand years as one day” (2 Peter 3:8) . I would further think that even Peter used the “thousand years” term as an analogy, and he easily could have said ten thousand, or a million, and it would not matter. Yahweh God exists without time, and therefore He is timeless and immeasurable. Genesis 1:20 And God said, Let the waters bring forth abundantly the moving creature that hath life [living creatures, or nephesh chay], and fowl that may fly above the earth in the open firmament of heaven. 21 And God created great whales, and every living creature [living creature, or nephesh chay] that moveth, which the waters brought forth abundantly, after their kind, and every winged fowl after his kind: and God saw that it was good. 22 And God blessed them, saying, Be fruitful, and multiply, and fill the waters in the seas, and let fowl multiply in the earth. 23 And the evening and the morning were the fifth day. Collectively, the animals created in the waters are called nephesh chay, a generic term for “living creature”. Genesis 1:24 And God said, Let the earth bring forth the living creature [living creature, or nephesh chay, psyche zosan] after his kind, cattle [behemah, tetrapous], and creeping thing [remes, herpeton], and beast of the earth [chay erets, theria] after his kind: and it was so. 25 And God made the beast of the earth [chay erets, theria] after his kind, and cattle [behemah, ktanos] after their kind, and every thing that creepeth [remes, herpeton] upon the earth after his kind: and God saw that it was good. 26 And God said, Let us make man in our image, after our likeness: and let them have dominion over the fish of the sea, and over the fowl of the air, and over the cattle [behemah, ktanos], and over all the earth, and over every creeping thing that creepeth upon the earth. 27 So God created man in his own image, in the image of God created he him; male and female created he them. 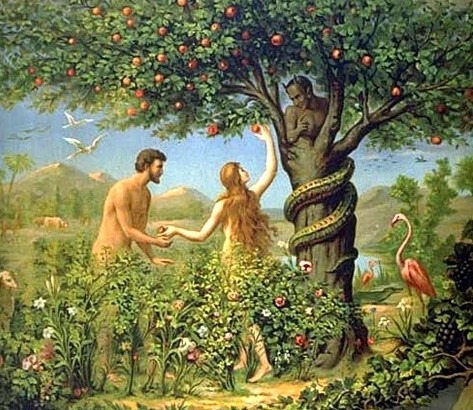 Yahshua Christ put His imprimatur on the extant account of the Creation of Adam, expecting us to both read and believe it, when He told us that it was written in the law, where He says “Have ye not read, that he which made them at the beginning made them male and female” recorded in Matthew and in Mark. He was citing a clause found in both Genesis Chapters 1 and 5 – and they are certainly both talking about the same creation of the same Adamic man. Verse 28 repeats the language of verse 26 concerning the man who was created in verse 27, and therefore they are all one and the same creation. Verse 26 proposes the dominion of man over other aspects of God’s creation, and verse 28 fulfills the proposal with God’s blessing. The proponents of the so-called “gap theory” love the way that the King James translators render the words of verse 28. Yet the Hebrew word rendered replenish is Strong’s number 4390, male’ or mal-ey and it means merely to fill. It does not mean fill again, as the word replenish infers. The Geneva Bible, the ASV and the Septuagint all have merely fill here, where the King James [per-] Version has replenish. Now I have a word for the so-called Dominion Theory advocates. Where here does it say that Adamic man is to have dominion over non-White races of so-called people? It does not even explicitly say here that Adam has dominion over the “beast of the field”! And even if that is implied in the phrase “every living thing that moveth upon the earth”, it surely does not mean that we are to teach the Laws of God to beasts. It may be found in Genesis 9 that the “the fear of you and the dread of you shall be upon every beast of the earth, and upon every fowl of the air, upon all that moveth upon the earth, and upon all the fishes of the sea; into your hand are they delivered.” But there is not one place in all of Scripture where dominion is granted by God over other races, and especially to rule over other races with the Law of God, which was only ever given to the children of Israel. Dominion theory as it is professed by some Identity Christian and British-Israel adherents today, is not found in the Bible, and therefore it should not be found in Christianity, which calls for nothing but total separation from all other peoples, or so-called “peoples”. 29 And God said, Behold, I have given you every herb bearing seed, which is upon the face of all the earth, and every tree, in the which is the fruit of a tree yielding seed; to you it shall be for meat [food]. 30 And to every beast of the earth, and to every fowl of the air, and to every thing that creepeth upon the earth, wherein there is life, I have given every green herb for meat: and it was so. 31 And God saw every thing that he had made, and, behold, it was very good. And the evening and the morning were the sixth day. Yahweh God looked upon His creation, which includes Adamic man in the flesh, and He saw that it was good. God therefore being the Creator of the flesh which is good, we cannot consider the flesh by itself and as God created it, to be evil. The flesh can be made by rebellious men to do evil, but the flesh is not evil in itself – and especially when God created it and called it good. The first scroll of Genesis, the Creation account, is not quite finished. It requires the first three verses of chapter 2, and the chapter and verse divisions were created by men thousands of years after these scrolls had been written and then copied into books.